"Margherita's marriage is slowly falling apart. Getting pregnant after trying for so long may have been a fabulous surprise for her, but for her husband it was the last straw. When she needs him most, her husband is just not there for her or their children and she realises that they need time apart to figure out where their marriage is going. As she struggles to come to terms with her new life, Margherita decides to leave London and spend the summer in Glen Avich, where her mum and stepdad have just opened a new coffee shop. She needs time away to reconnect with her daughter Lara and sort out her life. But Glen Avich can have a strange effect on people, and when she and Lara start working for Torcuil Ramsay at a rundown local estate, everything begins to change. Margherita finds her heart awakened in a way she never thought possible and Lara begins a new friendship with a mysterious local boy, Mal, which makes her mother feel increasingly uneasy. And just when Margherita is finally beginning to discover who she really is, she finds out how quickly things can change and how hard it can be to make brave choices." Set Me Free is the greatly anticipated new novel from the bestselling author of Watch Over Me and Take Me Home. Readers of Dani's books will be longing to revisit Glen Avich in the hope of catching a glimpse of some of the past characters as well as discovering new ones, and they will not be disappointed! Whilst this review is not about Watch Over Me or Take Me Home, and I can confirm that Set Me Free is an entirely stand alone book, I urge you to get yourself copies of all three books (and in fact you have the chance to win a copy of all three below). You can read what I thought of the first two by clicking on the following links - Watch Over Me and Take Me Home. It is not surprising that Watch Over Me (which was Dani's incredible debut novel) broke records as it sold over 445,000 kindle books before the paperback was even released as it is a beautiful book. 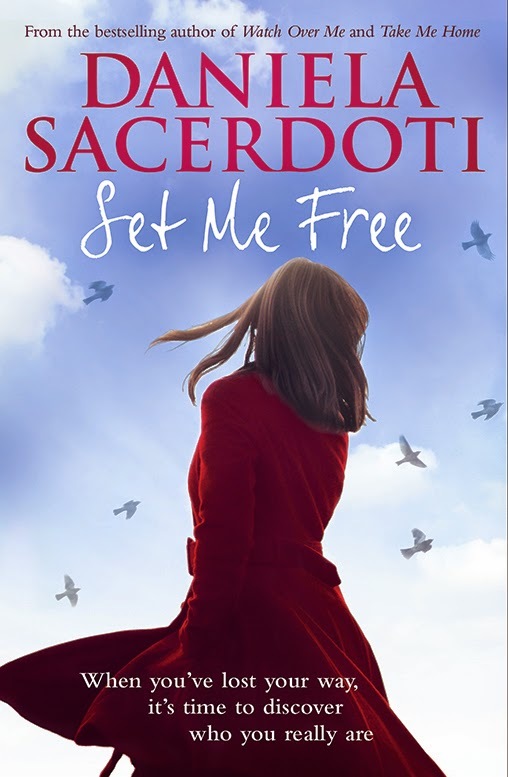 When I first turned the last page of Set Me Free, I thought it was my favourite book of Dani's so far, but having just sat and re-read my review of Watch Over Me, I think perhaps I got myself caught up in the moment. It might not be my absolute favourite but it is certainly one of my favourites and without a doubt comparably good. It made me realise how much I had missed Dani's books and Glen Avich. Dani has easily become one of my favourite authors of all time; Dani has a unique style of writing that sets her aside from other authors of the same genre and the storylines are instantly recognisable as being a Sacerdoti tale. Dani's adult books have the power to cast a spell over the reader; they are absolutely enchanting in a raw and powerful way. Whilst the characters lives are tinged with sadness, Glen Avich contains magic which has the potential to make everything better. Whilst Set Me Free is a standalone book, readers of the earlier Glen Avich books will recognise some of the characters. In particular, we get to catch up with Inary and there are also references to both Eilidh and Alex. I love the way that the Glen Avich books are intrinsically linked and the supernatural element which we saw in the earlier books continues in Set Me Free but once again it is subtly perfect. I have to admit, I had completely forgotten about the prologue until I saw it mentioned in a fellow reviewers review. I had got so wrapped up in the story that I had forgotten the clever hint that Dani had set right at the start. Set Me Free is a book of ethereal beauty; it is delicately sensitive and precious and you should bathe in its wonderfulness. I found myself racing towards the end of the book, desperate to know what happens but at the same time desperate for it never to end. Glen Avich and its cast will stay you for a long time, and I hope it isn't too long before Dani allows us to visit again! "I am the sun in my own solar system"
"Some ties, even if worn and constricting and infused with bitterness, are very difficult to break - maybe impossible. Not without severing parts of yourself with them, anyway." I must thank both Dani and Black and White Publishing. Dani once (via twitter) called me a bloggess (aka Blog Goddess) and promised that she would write my name into one of her books. She did not fail to deliver and it made it extra special reading those parts of the book that contained my name! 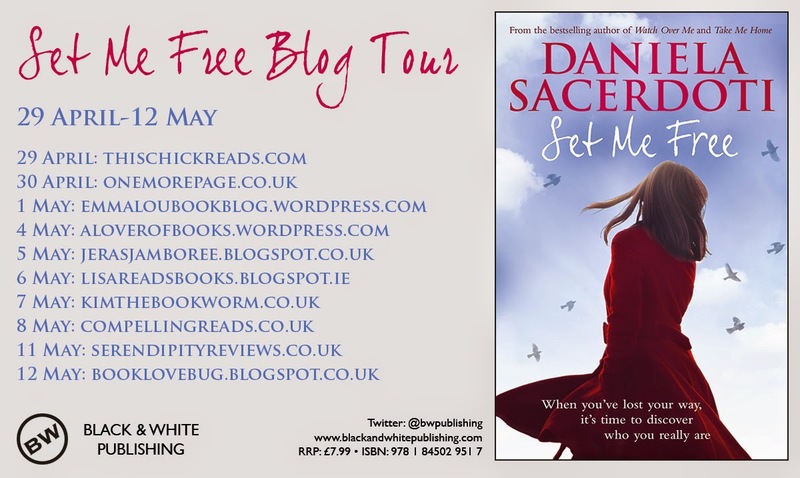 Thank you to Black and White for the copy of Set Me Free and including me in this fabulous blog tour. Black and White Publishing have produced a little recipe book with bakes from Margherita's Café so if you want to try any of the delights which are featured in Set Me Free head over to their website or Amazon where you can download it for free. Some of the descriptions are drool-worthy so if you're a baker, then I highly recommend it!